Irish stepdance is a kind of dance that has its origins in traditional Irish dance which appeared in pair with traditional Irish music. Irish step dancing consists in performing quick and complex feet movements while keeping ones hands and upper body rigid. These constraints can be explained by the fact that the original size of the stages used to be very small: they were made out of doors lying on the ground in order to get a hard surface to dance on. Arm movements would have thus provoked involuntary punches between the dancers in such a confined space. Moreover, the restricted space and reduced arm movements enable people to pay more attention to the complexity of the feet steps. Sometimes movements of the arms are inserted but this is considered to be a hybrid style. 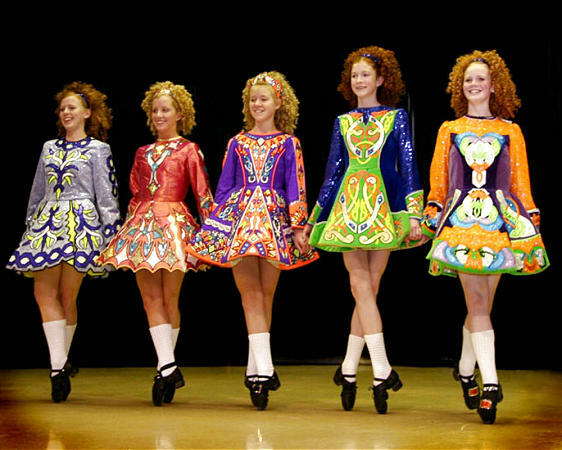 Every Irish stepdance choreography contains more or less the same primary steps. However it doesn’t mean that all the choreographies are the same! They simply depend on the creation of the choreographer who will produce a different choreography each time by changing e.g.the order of steps, the tempo, the songs, etc. The basic equipment required for a stepdancer is obviously the traditional pair of shoes. As mentioned above, there are two types of shoes: hard and soft ones. The former are made of fibreglass tips instead of metal enabling to increase the sound of the footwork and diminishing the weight of the shoe. Hard shoes have flexible soles and have eight striking surfaces: the toe, bottom and sides of the front tap and the back, bottom, and sides of the back tap. They are worn by both genders. Similarly, there are 2 types of soft shoes: those worn by female dancers, and those worn by male dancers. The first are similar to ballet slippers having a very flexible body whereas the second are more like jazz shoes having fibreglass heels. In case of important events -such as competitions- dancers wear special costumes. Girls wear traditional dresses which are very precious and expensive for solo performances. They can cost up to one thousand dollars each! However the dresses used for group performances are not that expensive or sophisticated. Nowadays the Irish stepdance has become famous around the world. A lot of schools have been created, mainly in the United States. 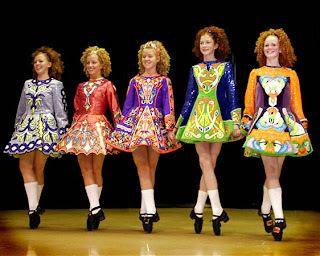 Moreover it is possible to take part in different competitions and to attend great shows such as the famous "Riverdance" .